"When philosophy paints its grey in grey then has a shape of life grown old. By philosophy's grey in grey it cannot be rejuvenated but only understood. The owl of Minerva spreads its wings only with the falling of dusk." -- G.W.F. Hegel, 'Preface', Philosophy of Right. The Internet as the fifth estate? "Philosophy, which once seemed outmoded, remains alive because the moment of its realization was missed. The summary judgement that it had merely interpreted the world is itself crippled by resignation before reality, and becomes a defeatism of reason after the transformation of the world failed." "Philosophical self-reflection assures itself of the non-conceptual in the concept. Otherwise this latter would be, after Kant?s dictum, null, ultimately no longer the concept of something and thereby void. The philosophy which recognizes this, which cancels out the autarky of the concept, strikes the blinders from the eyes.."
"No theory escapes the market anymore: each one is offered as a possibility among competing opinions, all are made available, all snapped up. Thought need no more put blinders on itself, in the self-justifying conviction that one?s own theory is exempt from this fate, which degenerates into narcissistic self-promotion, than dialectics need fall silent before such a reproach and the one linked to it, concerning its superfluity and randomness as a slapdash method. Its name says to begin with nothing more than that objects do not vanish into their concept, that these end up in contradiction with the received norm of the adaequatio." 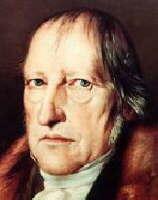 -"Philosophy has, at this historical moment, its true interest in what Hegel, in accordance with tradition, proclaimed his disinterest: in the non-conceptual, the individual and the particular; in what, ever since Plato, has been dismissed as transient and inconsequential and which Hegel stamped with the label of lazy existence. "In sharp contrast to the usual scientific ideal, the objectivity of dialectical cognition needs more subject, not less. Otherwise philosophical experience shrivels. But the positivistic spirit of the epoch is allergic to this." "Rationality itself is to an increasing extent equated more mathematico [Latin: in mathematical terms] with the capability of quantification. As much as this took into account the primacy of the triumphant natural sciences, so little does it lie in the concept of the ratio in itself. It is blinded not the least because it blocks itself off from qualitative moments as something which is for its part to be rationally thought." "One can no longer paddle along in the mainstream, even the word sounds dreadful of modern philosophy. The recent kind, dominant until today, would like to expel the traditional moments of thought, dehistoricizing it according to its own content, assigning history to a particular branch of an established fact-collecting science. Ever since the fundament of all cognition was sought in the presumed immediacy of the subjectively given, there have been attempts, in thrall to the idol of the pure presence, as it were, to drive out the historical dimension of thought. The fictitious one-dimensional Now becomes the cognitive ground of inner meaning." Glen Fuller has responded to this post on a paper he delivered on weblogging and media events at the Blogtalk Downunder Conference. He says that I misunderstood one of the key points in his argument. I may well have as this weblog roots are in the political world, not the philosophico-cultural studies world within a postmodern academia in Sydney. So let us have another look and try to sort out the issues. It is possible to witness that blogs, and other forms of New Media in general, have demonstrated they can play a specific role in the modulation of Old Media's production of a 'media-event'. This paper has two goals. The first argument shall attempt to locate the role of blogs in relation to the emergence of the media-event of the recent 2004 US Presidential Election. It shall be argued that blogging practice interrupts the temporal series of news-media production by Old Media and that it also creates a short-circuit in the feed-back loop between the producers and consumers of the media-event. The second argument is more speculative and stems from the first but places the role of blogging in a much larger and banal context. The key here is 'media event' which I understand as singular multiplicities that are singular irruptions into the regular flow of media. 9/11 would be an example. Language was very important here, eg., the 'war on terrorism.' Blogging can exist in the intersection of this ‘media event ’ and, presumably, blogging enables a particular mode of communication or discussion. Gary's reading of my paper suffers from not fully appreciating what I meant by 'potential'. I certainly did not say that all political events are determined by the media and that bloggers had a hand in such events. This is what Gary assumes I am arguing from selectively quoting my paper. Such an argument would be nonsense. I deliberately selected an event (US presidential election) that could be considered a media event or a composition or manifold of discrete media events (as many scholars have argued), where blogging clearly played a role in the media event. I went to extreme pains to argue that blogging may not have actually affected the outcome of the election (the historical event) and only affected the media reportage (media event). The purpose of my paper was to think of a way whereby blogs could be discussed alongside the mass-media without reducing it to a direct comparison or in terms of 'media effects'. I wanted to understand the relation between the mass media and blogging, the concept of the 'media event' is a very good tool to enable this discussion. Well no. I addressed the claim that 'what is produced by bloggers is discussion that enables and frames the event.' I questioned this in relation to Australia and argued that bloggers do not frame the media event. I argued that it is the corporate media that do this, or the parliamentary institutions. Mine was a hermeneutical point about the meaning of events not historical events, though I granted that interpretation and event are deeply intertwined. I wish it were otherwise. It has not happened over the war on terrorism. What is the issue here? Wark's book... takes a properly poststructuralist angle on 'history' and 'media events'. HIs is a second generation mass media studies and properly postmodern work on media events. Instead of 'history' being determined by sedimented symbolic structures of power and having 'media events' simply produce a double of this 'history' in the media, Wark's conception of media events is principally concerned with the newsworthy efficacy of the event. The complicating factor in this is that the newsworthiness can be self-perpetuating and self-emergent (there is an 'internal' feedback loop). There is no 'history' beating down upon a media milieu and forcing the media to pay attention. Attention itself is freed from the symbolic and historical links that once anchored it. Okay, I accept that. An example is the recent 'media frenzy' about the anti-terrorism raids in Sydney and Melbourne. The media did not report x happening, nor did they represent the state of affairs of 'the enemy within'; they intervened in it and helped to actualize it.